A geography workshop paired its students with nonprofit organizations to help solve critical community issues, offering a model of how to bring service learning into the classroom. Sarah Elwood, Professor of Geography. Photo credit: Lisa Faustino. Two fundamental questions help shape Professor Sarah Elwood’s approach to teaching a capstone course in the Department of Geography. These are important issues for Elwood and the students who participate in the Geographic Information Systems (GIS) Workshop, an upper-level course that uses emerging technologies and the power of spatial data to tackle the critical needs of community organizations serving underrepresented populations. “One of the many things we do in the geography department is to share with students our long-term commitment to public service and scholarship,” says Elwood, who has been widely recognized for her work inside and outside the classroom. “We have a deep commitment to giving students meaningful assignments that engage them in community service and prepare them with the skills they need once they leave the University,” she says. An example of that commitment was the most recent GIS workshop that Elwood taught, with about 40 students and two TAs working alongside organizations such as the South King County Food Coalition, Northwest Justice Project, Statewide Poverty Action Network, and Real Change News, a newspaper sold by the homeless in the Seattle area. “All of the groups have pressing needs, and the urgency of the work makes the classroom experience real for the students,’’ Elwood says. Linking class work to real world experiences is a valuable teaching and learning tool. 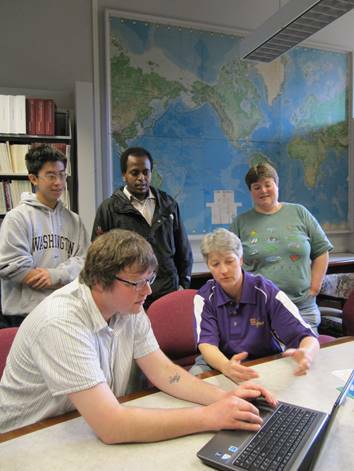 And the UW geography department offers a model for other departments to emulate those experiences in their own workshops or classes. It is certainly an approach that has worked well for the students, offering a tough challenge with a great payoff, said Jacqueline Ines, a former student who worked with the South King County Food Coalition, a group of 12 food banks collectively serving more than 35,000 families each year. The coalition partnered with the workshop to help find unserved potential clients and develop strategies to connect people in need to food bank services in a decentralized geographic area. “This was one of my favorite projects to work on because it was equally fun and stressful to have a real-life audience to present our work to who would be utilizing the findings we ended up producing,” Ines says. Geography students learn to use GIS — at its most basic, a software for gathering, managing and analyzing geographic data. And because it is deeply rooted in geography, that data is integrated into maps — where information is more easily brought to life. Practically every field of study uses GIS to make maps that help them better understand an issue and solve problems. Whether someone is studying loss of habitat in the swamps of Florida, the effects of climate change on economically undeveloped island nations, or the opioid epidemic in the Midwest, you can bet that GIS tools are being used to map it all in order to understand the root causes and ultimately offer solutions. These are some of the reasons Professor of Geography, Timothy Nyerges founded the workshop nearly two decades ago. He wanted students to use their GIS skills to gain a better understanding of environmental and sustainability issues. 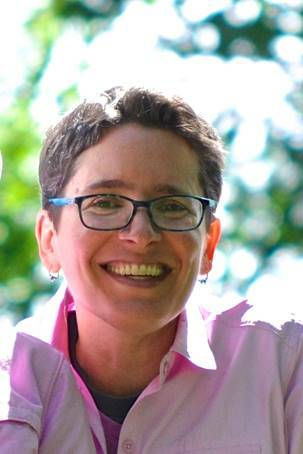 Elwood started teaching the workshop shortly after she came to the University in 2006, shifting the focus of her course to social justice and poverty issues. Today, professors take turns teaching the workshop, with topics switching back and forth. Professor Suzanne Withers will be teaching the workshop in spring 2019. But no matter the field under study, Elwood says acquiring and working with data is difficult — and often quite expensive. That makes it inaccessible to community organizations, including food banks and environmental nonprofits, seeking to improve their decision-making. That’s where the partnership with the UW students comes in. GIS has migrated to the web and cloud computing, and accessing, analyzing and applying the needed data is a complex undertaking. Putting a map together for use by a client such as a food bank requires specialized skills and teamwork, and GIS students are versed in a number of the technologies needed. Students work closely with their South King County Food Coalition community project partners during the workshop. Courtesy of Sarah Elwood. Consider the work of Ines and her fellow students with the food coalition, Elwood says. The South King County Food Coalition was seeking to answer that fundamental question, as well as several others, when it started working with the geography department. The coalition has been considering whether to start a mobile van service to deliver food to some of their most vulnerable clients, including elderly residents living in isolated areas with no public transportation and single parents who have little time to travel to a food bank. But it needed to know where those clients were. Ines and her team set to work. Using GIS, they identified and mapped regions in South King County that were underserved by the food coalition, explored the prospect of introducing a mobile delivery service to the Des Moines Area Food Bank’s operations, and compiled an analysis of data to locate potential long-term volunteers to help grow the coalition’s fresh produce at Elk Run Farm. “While we all collectively worked on the end-product, we were able to split parts of the projects out to those who were comfortable extracting and analyzing the types of data we had to investigate for each individual part,” Ines said. “Two of my partners focused more on the bivariate choropleth map (a map that uses color to show quantities within a geographical area) because they did the most research on the data that was used to create that map, while another partner and I were primarily responsible for the hot spot map (a map that uses statistical analysis to define areas of high occurrence versus areas of low occurrence). I think we created a helpful map for them,” she said. International Studies did for its capstone projects. Students bring all kinds of experiences, and that’s particularly important in a workshop that relies heavily on tech tools. So make sure each student team is balanced, such as Ines’ team. And don’t overlook the intangibles. UW students come from all social and class backgrounds, and they have much to learn from one another. Help them recognize how these differences can make for a better team. Read Professors Elwood’s and Nyerges’ biographies, visit a leading commercial GIS company’s showcase site to learn how different groups use the technology, check out how to make a bivariate choropleth map, and don’t miss Real Change’s article that includes GIS workshop data.